The Vancouver Condo Buzz » From Low $600’s > North Vancouver LODEN GREEN Townhomes in Maplewood Community Now Previewing! Live close to water, city and mountains! « 58 HOMES FOR SALE at Marquee on The Drive Vancouver Apartments > Boutique, Energy Efficient and Affordable Vancouver Condos! From Low $600’s > North Vancouver LODEN GREEN Townhomes in Maplewood Community Now Previewing! Live close to water, city and mountains! Beautiful design, architecture and smart features grace every one of the 30 new North Shore townhomes at Loden Green North Vancouver. 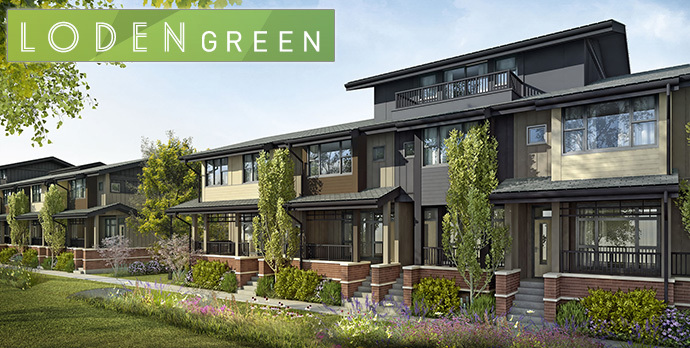 Situated in the pedestrian and family friendly neighbourhood of Maplewood North Vancouver Loden Green townhomes is all about homes that are designed for healthy urban living both inside and out. All of the homes will feature 3 spacious bedrooms and 2.5 bathrooms welcoming lots of natural light, over height ceilings and extra large windows capturing picture perfect views. The craftsman contemporary homes at the North Vancouver Loden Green townhome project also features a front door and front porch for that traditional single family feel. 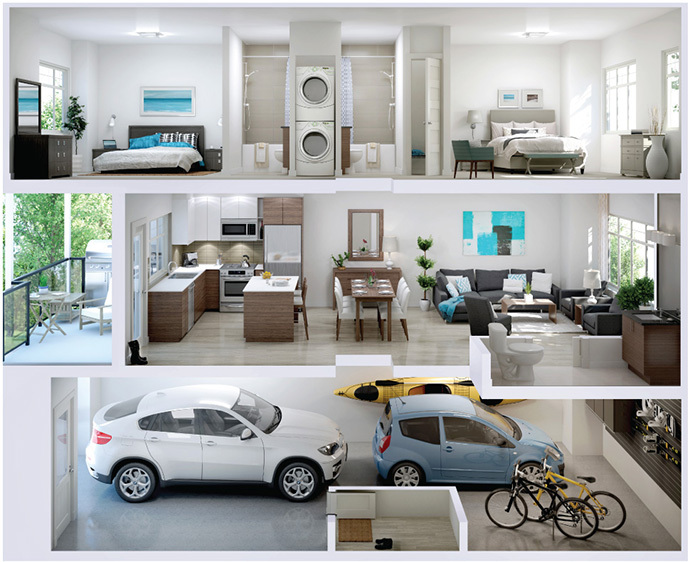 This private community of multi-level townhouses will feature flexible living spaces that include attached two car garages as well as a very large store room and three bedrooms on the upper floor, which is ideal for families of all sizes. Some of the floor plans also feature master bedrooms on the top floor with their own private ensuite bathrooms. Well designed and very functional, the floor plans at Loden Green North Vancouver Maplewood are exceptional for any couple or family. All of the townhouses are built to Built Green Gold standards, making them exceptionally healthy and sustainable. With maximum insulation, enhanced ventilation and air quality for the best living experiences, home owners at Loden Green North Vancouver Maplewood will have comfortable living spaces throughout the year. Innovative construction and design features will make them very energy and water efficient as well. One of the best features of this unique and boutique Maplewood North Shore development includes it’s amazing location next to all the outdoor recreational options you expect from this neighbourhood. The Spirit Trail wraps around three sides of this beautiful property, with the Heritage Lane on the fourth side, giving you a private, quiet and beautiful green community. The Seymour River is just a few paces away and the north side of the development will feature a new biking path, public art and outdoor amenities. Just fifteen minutes away from the new North Vancouver Loden Green townhomes is Vancouver, Burnaby, Deep Cove, Central/Lower Lonsdale, as well as all of the North Shore mountains. Visit www.lodengreenliving.com for all the details about Loden Green North Vancouver including floor plans, interior features, site plan and community highlights. Loden Green. Designed for life. The development team for the Maplewood Loden Green North Vancouver townhome project includes Guildford Brook Estates Development Corporation and Cornerstone Architecture. The beautiful homes will feature high-end finishes and detailing throughout. This is one of the most luxury North Vancouver townhouse projects this year, so don’t miss out! Starting from the low six hundred thousand dollar range, the new Loden Green Maplewood townhomes will feature wood grain rectilinear porcelain tile, laminate floors in the living room, dining room, kitchen and stairs in addition to wool blend carpeting in the bedrooms and hallways. Presale homebuyers can also upgrade to engineered hardwood floors. The bottom floor is rough-in with a security alarm panel/system and all homes come with the comprehensive 2-5-10 year warranty through WBI. The bathrooms at Loden Green North Shore townhomes will feature Chelini Collection 20” by 14” under mount rectangular basin for master ensuites as per floor plan in addition to beautiful glass mosaic tiling as accents. There is Softouch Series cabinets and composite stone counters. All bathrooms will feature dual flush Toto toilets that are water efficient in addition to Moen faucets in showers and bathtubs. The ensuite bathrooms at Loden Green Maplewood townhomes will feature American Standard soaker tub with integral apron bathing pool. The homes will also feature stacked white full size washer and dryer by Whirlpool. The kitchens at North Shore Loden Green townhouses in Maplewood community will feature composite quartz counters, Fhiaba soft close cabinetry and Blanco stainless steel under mount kitchen sink (double bowl). The sink will also feature a single handle high arc pull down faucet by Moen an a garburator. There is glass tile for the backsplash in addition to a high-end kitchen appliance set by KitchenAid Architect Series (Energy Star rated). These include a 30” wide fridge with bottom mount fridge with side swing bottom freezer door in addition to a 30” slide in gas range with four burners and convection oven and a 24” built in dishwasher with concealed control panel, tub and door liner. As well, the Loden Green North Shore townhomes will come with a 30” over the range microwave and range hood fan. Loden Green Townhomes – Where tomorrow thrives! Loden Green North Vancouver townhomes is a select collection of 3 bedroom North Shore townhouses in a beautiful setting. Every home at Loden Green has its own double garage with additional storage for the bikes and kayaks and other items that allow us to get the most from this remarkable location. An intimate community of just 30 row style North Shore townhomes in the family friendly neighbourhood of Maplewood North Van is coming soon from the low $600’s! Visit www.lodengreenliving.com for all the details about Loden Green North Vancouver including floor plans, interior features, site plan and community highlights. 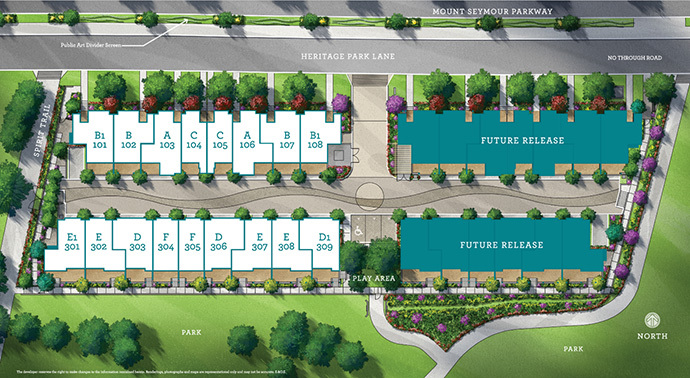 Loden Green homes will be situated in the safe and friendly Maplewood North Vancouver neighbourhood. Just thirty 3 bedroom townhomes will be available here with prices starting from the low $600’s, making them very affordable for couples and families alike. They are built to Built Green Gold standards which means that they are environmentally savvy as well as healthier for you, the home owner. The Maplewood North Vancouver Loden Green townhome location is superb as you are just 10 minutes away from Deep Cove with all of its outdoor amenities in addition to five minutes away from Capilano University. As well, the new North Shore town homes are just seconds away from the city’s best biking and hiking trails. Outdoor amenities and experiences are just minutes away from your front door, but downtown Vancouver is also clearly accessible and just 15-20 minutes drive away. Lonsdale, Park Royal, The Drive and much more are also very close. Loden Green North Vancouver townhomes is a rarity on this side of the district, where there is currently a moratorium east of the Seymour River. This means that this style of townhouse project on this side of North Vancouver District is truly unique for many years to come. The collection of 30 residences are tucked neatly between the Spirit Trail on 3 sides of the property as well as Heritage Lake on the fourth side. You’re surrounded by nature, trails, beautiful parks and natural green spaces. Move-ins are expected to be in Winter 2014. The new North Vancouver Loden Green townhomes is poised to bring a fresh new outlook in attached living to the North Shore. These are inspired by single family living as they are very spacious, with most of the homes over 1,400 square feet in size. The floor plans at Loden Green town homes in North Vancouver will have attached double garages with extra storage space for bikes and kayaks. The open plans are contemporary and bright and the features/finishes are modern and upscale. Because Loden Green townhouses start from the low six hundred thousand dollar range, home buyers are getting more space for a less expensive price, but in a neighbourhood that is clearly superior. This limited opportunity sounded by the lush green spaces of Spirit Trail and Park will be launching in early 2014! The new North Vancouver Loden Green Townhomes feature 3 bedroom residences that will be built to BuiltGreen Gold standards. The upscale finishes will include 2 car oversized garages, easy access to both urban amenities and outdoor recreational options and much more. The entire Loden Green North Vancouver townhouse project will only offer 40 opportunities and is located just off Mount Seymour Parkway.